Air Mattress Review of the Etekcity Air Bed with Built In Pump! This is a blow up mattress that can go camping (as long as you have access to a regular plug and electricity to blow it up or bring it already blown up). The older version has a pump that is rechargeable so you don’t need a plug. 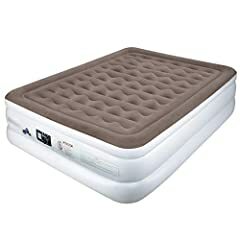 This is a tall air bed that we think looks like an ice cream sandwich! You can use it as a guest bed, for travel, an RV, in the back of a truck or SUV or any time you need an extra bed that’s fast and easy to set up. 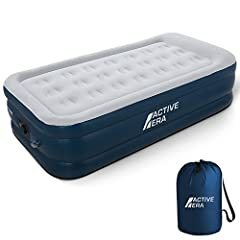 This is an affordable air mattress that has a built-in inflator and deflator. The cord fits right into a compartment on the bed. It’s very easy to set up and take down. No blowing required! 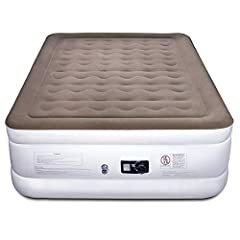 People also use this air bed for everyday use. You won’t need a box springs or base because it’s adequate on its own. 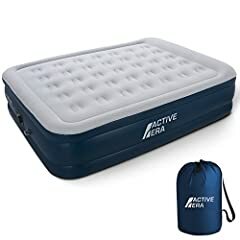 Active Era Premium Twin Size Air Mattress (Single) - Elevated Inflatable Air Bed, Electric Built-in Pump, Raised Pillow & Structured Air-Coil Technology, Height 21"